...tweeted Donald Trump as President-Elect; ‘if they do, there must be consequences – perhaps loss of citizenship’. His administration has also suggested repealing the 14th amendment allowing birthright citizenship. Some even want to strip citizenship from US-born children of undocumented immigrants. Citizenship, and how it designed and regulated, is the critical issue in America today. This series seeks to engage the campus community with elements of the national conversation. We look to understand the nuances of contemporary US citizenship, the challenges it faces, and the strategies we might advocate in seeking to strengthen its promise. We aim also to excavate its heritage, from antiquity, through the founding, the Civil War, the women’s suffrage movement, and the Welfare State, to discover how earlier experiences have shaped the contours of what we see as “natural” today. The Changing Faces of U.S. Citizenship series will join faculty from the Departments of Political Science, History, Black Studies, Classics, and English, and the Carsey-Wolf Center in a collaborative program of undergraduate and graduate course offerings, panel discussions, a research colloquium, public lectures, film screenings, and workshops with local schools throughout the academic year 2017-18, and Fall 2018. How do the postures of our bodies communicate citizens' dissidence or conformity, non-compliance or care? When Kaepernick kneels, Black Lives Matter lie down in the streets, soldiers stand at attention, citizens stand to put their hands on their hearts at sports events, and we all speak of moral fortitude as having a spine or showing a spine, are these mere dramatizations and harmless metaphors? Or might they tell us something about the gendering of moral conscience? This talk will look at the significance of posture of obedience and disobedience in a variety of texts, from Sophocles' "Antigone" to Euripides' "Bacchae," from speeches/interviews by Muhammad Ali to photographs of Colin Kaepernick. At the age of 85, U.S. Supreme Court Justice Ruth Bader Ginsburg has developed a lengthy legal legacy while becoming an unexpected pop culture icon. But the unique personal journey of her rise to the nation's highest court has been largely unknown, even to some of her biggest fans - until now. RBG (2018) explores Ginsburg's life and career through interviews, public appearances and archival material. Betsy West and Julie Cohen (co-directors) will join moderator Jeannine DeLombard (English, UCSB) for a post-screening discussion. For further details, please view the flyer here. Citizenship is most often discussed as a question of legal status within a framework of rights and occasionally duties. 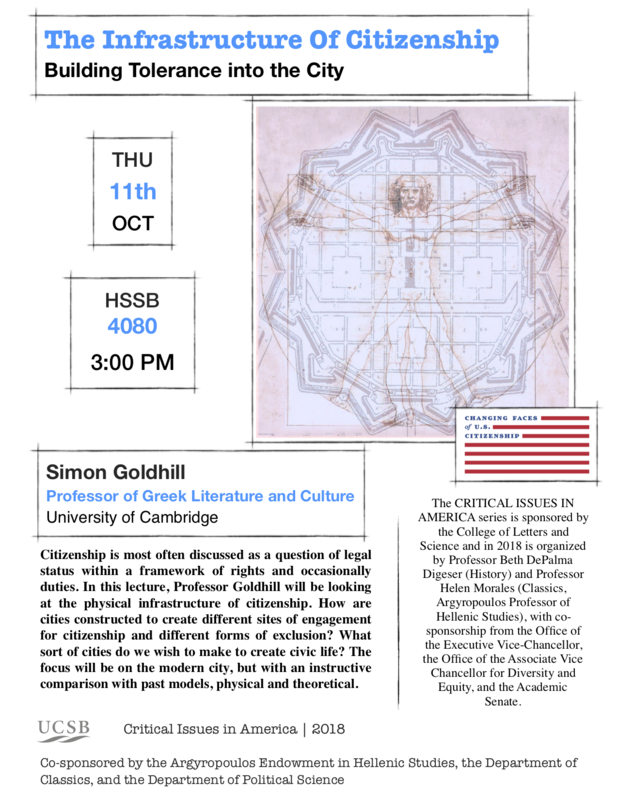 In this lecture, Professor Goldhill will be looking at the physical infrastructure of citizenship. How are cities constructed to create different sites of engagement for citizenship and different forms of exclusion? What sort of cities do we wish to make to create civic life? The focus will be on the modern city, but with an instructive comparison with past models, physical and theoretical. What common knowledge do modern states expect of a (good) citizen? In this workshop, we will consider the ideology, frameworks and assumptions behidn the quesitons that constitute the United States' Civics Exam (Part of the U.S. Naturalization test) and Britain's Life in the UK Test (Part of the British Citizenship Test). In Particular, we will examine how these repertoiries of assumed common civic knowledge align (or do not) with the kinds of content typically rehearsed int eh Athenian funeral orations, speeches ritually delivered for the war dead over the course of some century-and a-half in classical Athens (c.460-320 BCE). The title for this lecture references a series of court opinions in 1901 that marked a decisive turn in the United States' practice of what has since become known as 'differentiated citizenship.' Working backwards from this historical conjuncture, Professor Padilla Peralta will examine the appearance of systems of differentiated citizenship in the Greco-Roman Mediterranean and comment on their reception in several modern colonial (and postcolonial) contexts. Since 2017, the Trump Administration has drastically limited access to American citizenship, be it refugees seeking to escape violence and start a new life in the United States or young undocumented immigrants brought to this country as children. Julie Rodriguez, state director and senior advisor to U.S. Senator Kamala D. Harris, will survey U.S. immigration policy in 2018 and its impact on notions of citizenship. A former senior public engagement official to President Obama, Rodriguez will also address recent efforts to solve the immigration crisis and conclude with current efforts to resist and organize against the Trump Administration's deportation force. This event is co-presented by the Critical Issues in America Series. In the comedic documentary The Problem with Apu (2017), South Asian-American comedian Hari Kondabolu confronts his long standing "nemesis" Apu Nahasapeemapetilon - better known as the Indian convenience store owner on The Simpsons. Kondabolu discusses how this controversial caricature was created, burrowed his way into the hearts and minds of Americans, and continues to exist - intact - nearly three decades later. Featuring interviews with Aziz Ansari, Kal Penn, Whoopi Goldberg, W. Kamau Bell, Aasif Mandvi, Hasan Minhaj, Utkarsh Ambudkar, Aparna Nancherla and more. The film is currently streaming on truTV.com. Writer and comedian Hari Kondabolu will join moderator Kum-Kum Bhavnani (Sociology, UCSB) for a post-screening discussion. While the Fourteenth Amendment guarantees citizenship to those born or naturalized in the U.S., this Constitutional right has endured attacks since its passages in 1868, and it continues to be at risk today. 14: Dred Scott, Wong Kim Ark & Vanessa Lopez (2014) traces these battles from their roots in the struggles against slavery prior to the Civil War, to the first against the Chinese Exclusion Act in the late nineteenth century, to current anti-immigrant agitation. The documentary focuses on the stories of three families whose courage in challenging the status quo changed history: Dred and Harriot Scott, Wong Kim Ark, and Rosario and Vanessa Lopez. Director Anne Galisky will join moderator Helen Morales (Classics, UCSB) for a post-screening discussion. Thousands of stateless persons live in the shadows in the United States. They are at once denied access to the United States, and unable to leave. The case for providing this population a path to US citizenship is grounded in our history of human rights and refugee protection. However, current immigration policies are aggravating the problem and perpetuating the global statelessness crisis. Developed in conjunction with the Critical Issues series, a new GE course in Classics (CLASS 152: Citizenship: Ancient Origins and Modern Practice) is being taught for the first time this quarter. Through close analysis of such authors as Aristotle, Cicero, and Seneca and examination of how ancient ideas have been applied to modern debates, students will investigate the relevance of classical models to citizenship in the contemporary US.